Justice is too often denied to victims who have meritorious claims but cannot afford to pay a lawyer. When a lawyer does agree to represent a plaintiff, it is often on a contingency fee basis, which means that the lawyer self-finances the costs of litigation. 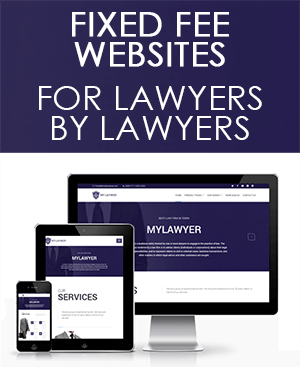 Most good plaintiff lawyers will have dozens or hundreds of lawsuits pending at any one time, which means that they are self-financing the costs of numerous lawsuits at any given time. The lawyer is therefore often pressured to settle for much less than the victim deserves and could recover in a well-funded, all-out litigation suit. Alternatively, a litigant may need to seek a loan from a financial institution which can have hefty interest rates and repayment terms. In Australia, there is strict lending criteria which means funding will only be provided if your case has a very high chance of success and the terms of the financing agreement will leave you with as little as 40% of your settlement. To most, being able to sue to recover $400,000 of the $1,000,000 owed to them compared to not being able to afford litigation at all is an attractive proposition. Using crowdfunding as an alternative to seeking an institutional loan can restore the power to the litigant. With crowdsourced funding, the litigant is able to offer an attractive rate of return to be paid to investors when the court case is settled. This rate of return can be so attractive that it lures investors with a social conscience and provides them with a return higher than could be expected from the stock exchange. The best part is that despite offering such an attractive rate of return to their investors, they can keep the majority of the settlement funds when the case reaches its conclusion. 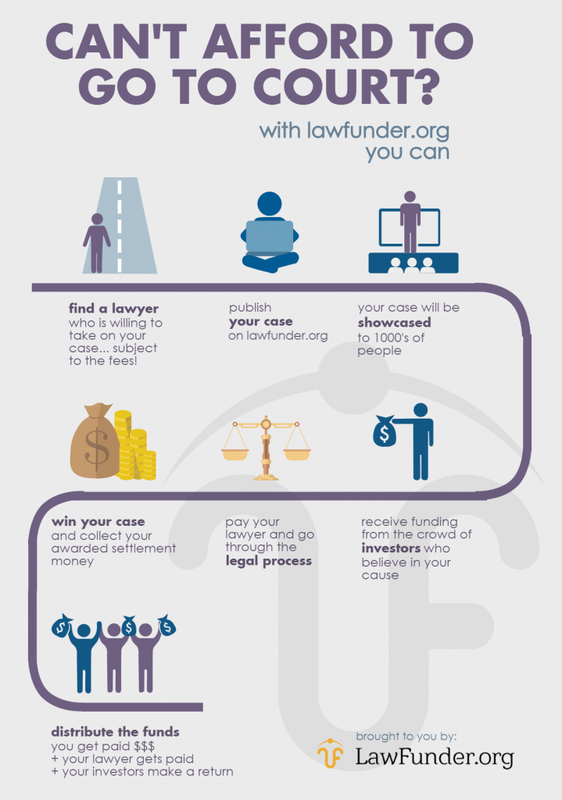 Lawfunder.org serves as a live example of a crowdfunding platform which attempts to correct the balance of the unequal justice system by enabling investment in legal cases. 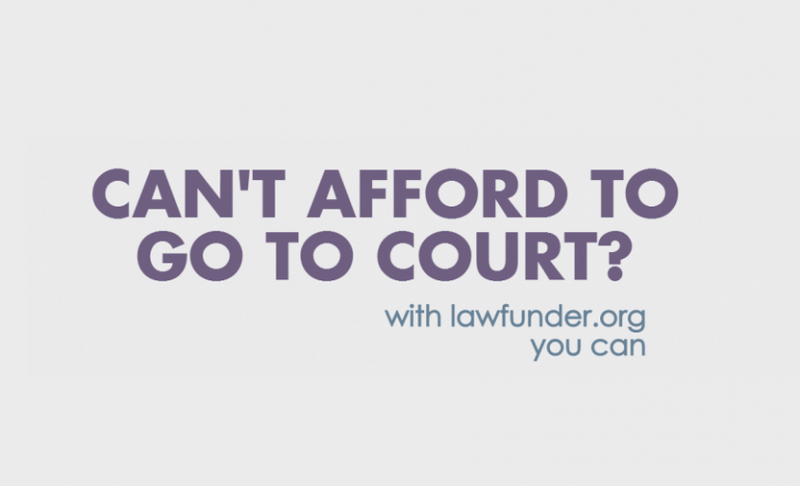 By helping connect plaintiffs with capital, Lawfunder levels the playing field for those unable to afford access to the justice system – a basic human right that all should be entitled to. Lawfunder.org also works with Australian Community Legal Centres to post general fundraising campaigns to assist the shortfall of government funding. 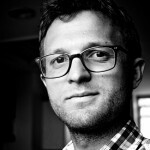 Lawfunder was created by Sean Roche, a young lawyer and entrepreneur based in Brisbane, Australia. Putting the power back into the litigant’s hands in this way is fantastic and will have a considerable impact on achieving fair and due justice. I personally look forward to recommending Lawfunder to my clients.